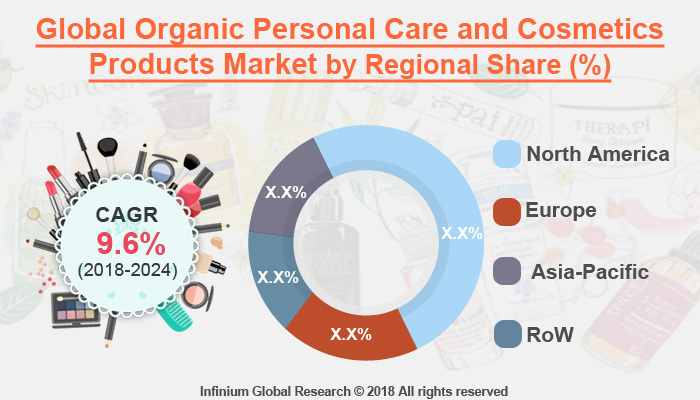 A recent report published by Infinium Global Research on organic personal care and cosmetics products market provides an in-depth analysis of segments and sub-segments in global as well as regional organic personal care and cosmetics products market. The study also highlights the impact of drivers, restraints and macro indicators on the global and regional organic personal care and cosmetics products market over the short term as well as long term. The report is a comprehensive presentation of trends, forecast and dollar values of global organic personal care and cosmetics products market. According to the report, the global organic personal care and cosmetics products market is projected to grow at a CAGR of 9.6% over the forecast period of 2018-2024. Organic personal care products are used in personal hygiene and beautification purpose. The subsectors of organic personal care products comprise organic cosmetics and organic personal hygiene. Some of the products that are included in organic personal care are toothpaste, toilet paper, talcum powder, moisturizer. Additionally, it includes shaving cream, perfumes, pomade, makeup, lotion, lipstick, lip gloss, facial tissue, eyeliner, deodorant, cotton pads, cotton swabs, colognes, and cleansing pods etc. Continuous growing awareness regarding the various benefits of organic personal care products over synthetic personal care products is generating huge demand globally. Organic products are derived from natural resources, that are free from harmful chemicals. The spiral growth in the demand for organic personal care products in recent times is prompting manufacturers to introduce new products and focus on research and development. As a result, the organic and natural personal care market has become a major segment of the cosmetics and wellness sector over the past few years and the trend is poised to continue over the forecast period. Stringent government regulations, especially in developed countries, have forced the companies to introduce organic products over chemical products because these are not harmful as compared to chemical products. Additionally, chemically formulated cream use several rare animals’ extracts, and promote the poaching of these rare animals, whereas organic beauty care products don’t require animal extracts. Longtime application of chemically formulated beauty products on face deform the color complexion of consumers. Hence now consumers are preferring the organic one compared to chemically formulated products. Increasing consciousness about personal appearance and overall health awareness are helping to the growth of organic personal care and cosmetics industry. Moreover, increasing disposable income coupled with improved standards of living drive the adoption of personal care and organic cosmetics products. However, the brief shelf life of organic personal care and cosmetics and the availability of advanced beauty treatments are restricting the growth of this market. However, the government support and regulation would offer several growth opportunities to the players in the market. Globally, North America holds a lion share of organic personal care and cosmetics product market. Europe follows North America in terms of demand for organic personal care products and is expected to remain a lucrative regional market for the same through the course of the forecast period. The Asia-Pacific market is witnessing rapid growth due to the increasing awareness about the benefits of organic personal care and cosmetics products among consumers. Further entry of several multinational companies in this regions is helping to grow this market. Additionally, the influx of working women and their increasing disposable income is boosting the growth of this market in this region. The report on global organic personal care and cosmetics products market covers segments such as product type and distribution channel. On the basis of product type, the global organic personal care and cosmetics products market is categorized into skin care, hair care, oral care, makeup or color cosmetics, and others. On the basis of the distribution channel, the global organic personal care and cosmetics products market is categorized into the organized retail store, online sale, and convenient store. The countries covered in the North America region include the U.S., Canada, and Mexico; while the Asia-Pacific region includes countries such as China, Japan, India, South Korea, Malaysia, and among others. Moreover, Germany, U.K., France, Spain, and Rest of Europe are the major markets included in the European region. The U.S. drives the growth in the North America region, as it is the largest market in the region. In the Asia-pacific region, rapid industrial growth in India and China offer a substantial potential for the growth in the organic personal care and cosmetics products market. As a result, the APAC region is projected to experience a growth at a CAGR of x.x% over the forecast period 2018-2024. The report provides profiles of the companies in the global organic personal care and cosmetics products market such as L'Occitane en Provence, LOreal International, Arbonne International, LLC, Burt's Bees, Estee Lauder Companies Inc., Amway Corporation, Oriflame Cosmetics S.A, Yves Rocher, Weleda, and Aubrey Organics. The report provides deep insights into demand forecasts, market trends, and micro and macro indicators. In addition, this report provides insights on the factors that are driving and restraining the global organic personal care and cosmetics products market. Moreover, IGR-Growth Matrix analysis given in the report brings an insight into the investment areas that existing or new market players can consider. The report provides insights into the market using analytical tools such as Porter's five forces analysis and DRO analysis of organic personal care and cosmetics products market. Moreover, the study highlights current market trends and provides forecast from 2018-2024. We also have highlighted future trends in the organic personal care and cosmetics products market that will impact the demand during the forecast period. Moreover, the competitive analysis given in each regional market brings an insight into the market share of the leading players. This report will help manufacturers, suppliers, and distributors of organic personal care and cosmetics products market to understand the present and future trends in this market and formulate their strategies accordingly.